Do you know a local nonprofit organization that could use some free advertising? 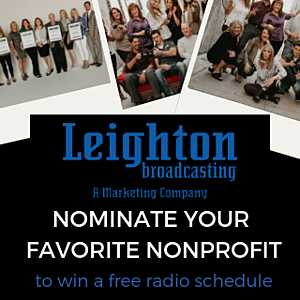 We're asking you to nominate your favorite local nonprofit organization that deserves a free radio schedule. A 13-week, 21 ads per week branding schedule on select Leighton Broadcasting radio stations. How do we pick a winner? The nonprofit in each market with the most nominations will win. How many times can I nominate a nonprofit? We ask that you only submit one nomination per nonprofit. Nominate your nonprofit by filling out the form and tell us why you love them, and why they deserve a free radio schedule.